15x15 Large 2 Line Address Plaque - - estate size 15" x 15" square address sign. Personalized with the house number and street name you provide. Made in USA. Line 1 for the house number holds up to five (5) 4.5" numbers. Line 2 for the street name holds up to twelve (12) 2" characters. 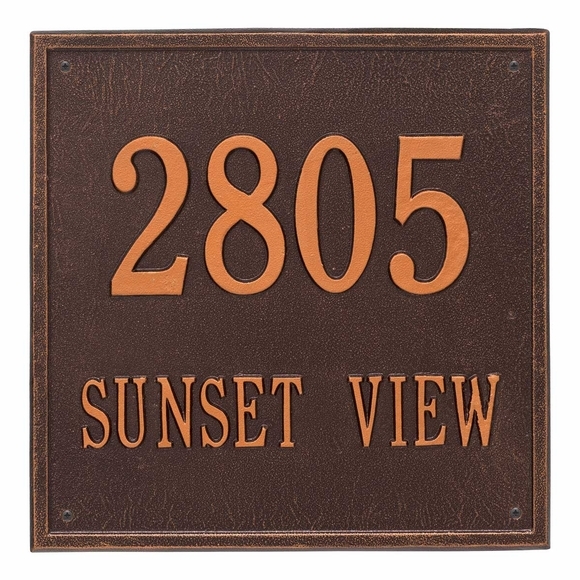 Address shown above: 2805 SUNSET VIEW. This sign also comes with 1 line or 3 lines and in medium 11" x 11" and small 6" x 6" sizes (see Related Products).